Turn Every New Or Seasoned Chiropractic Assistant Into A Ninja Black Belt With Your Own Fail Safe Operational Procedural Manual Designed To Support And Grow Your Chiropractic Practice! Master checklists for all procedures - front desk to P.R. Get Your Black Belt C.A. Procedural Manual That Trains New And Seasoned C.A.s Quickly And Easily On Everyday Practice Success Techniques! Enjoy Your 4 Super Bonuses For That Extra Growth! My top 3 social media marketing tools that drive in 150 to 250 new patients every time. Your C.A. 's Have All Quit, You're All By Yourself, You Have Tons Of Adjustments, 4 New Patients and That New C.A. You Just Hired This Morning...Can't Spell Chiropractic! Life happens! And there can be times of stress where you’re short staff and don’t have an operational manual to fast track that new C.A. Let me show you how easy it is to hire and train a new Black Belt C.A. with lightning speed, using my "Black Belt Chiropractic Assistant Procedural Manual!" Research has shown, that for every C.A. you lose, you are also losing a minimum of $10,000 to $25,000. And that's direct dollars, and doesn't include dollars lost from lack of experience. You know the drill. We've all been there. The frustration of hiring, training, the slow down in practice volume and low months of income. Never mind the sleepless nights and going home to your spouse, bitching because of all the mistakes and errors found. And you don't even have an operational manual…a safety net to catch your practice’s downward fall. And it’s happened to me in the past. I lost my best C.A. 's who left one day for a new career. There I was...standing at my front desk with no superstar to steer my ship. I thought I was SCREWED! But I had a ton of training material that I had collected over the years. I worked feverishly over that week to put together my "CA Black Belt Operational Field Guide"...and VOILA!... I was rescued. Now all of those secrets, procedures, safety nets, front desk strategies and tools can be yours, in an easy to implement step-by-step, scripted, cookie cutter procedural manual for C.A.'s! It is definitively Chiropractic's most simple, easy-to-use and effective C.A. manual. I Gave The C.A. Black Belt Procedural Manual To A New C.A....And She Was Up And Running Like "Super Woman" Within 2 Weeks! With all the business in our lives, many doctors tell me that they just don’t have time to train their existing C.A. 's, much less their new ones. And the irony lies in the FACT...that if you don't take the time to train your C.A. 's...then you are not GROWING. As a matter of fact, you are probably DYING! And doctors who are either coaching with me, or attending my Mastery Training Universities...are growing 30% - 150%, which includes our world-renowned C.A. training program. It’s the exact same materials that you’ll find in our procedural manual. We know the importance of continually training your assistants. This is justified by the accolades that are always pouring in from doctors who are dipping into my training sessions. If I Could Show You How To Duplicate A Process That Creates An Avalanche Of New Patients Into Your Practice...Would That Be Of VALUE To You? Maintaining and even increasing your patient visits...before they collapse. Mastering the art of front desk referrals because your assistant is properly scripted. Gain new families through my 6-step process for getting family members checked. Hiring and training the right C.A., so you don't have to repeat the process again. Philosophy and anatomy 101 for every newbie...on vital and important chiropractic terminology. How to flawlessly manage, maintain and recall your patient volume. Mastering the art of employee agreements, financial reports and checklists. Boost your pediatric population by getting kids under care. Learning and mastering proper telephone etiquette and procedures, so you capture every new patient and appointment...because every dollar counts! I've Done This, Hundreds Of My Doctor's Have Effortlessly Duplicated This From My Years Of Training...Now You Have The Opportunity To Capture Your Rescue Kit...And Prevent Any Meltdowns In Your Practice! Then There's One Waiting For You Right Here! And Here's The Great News. We've just put the finishing touches on our brand new, step-by-step, scripted manual for C.A.'s. I call it the "Black-Belt C.A. Procedural Manual" - It's like your own personal Operational Field Guide...because it's used by hundreds of doctors in the Masters Millionaire Protege Club. 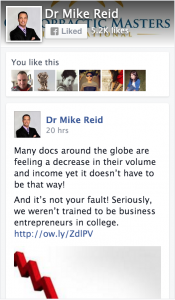 These are doctors who are in the trenches with you and producing a 7-figure income. You heard that right! Doctors who are cracking the million-dollar mark! How? Because they understand the direct relationship between training a team full of superstars and growing a superior practice! 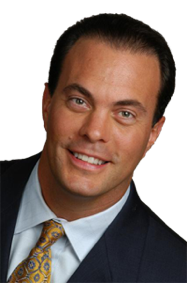 "Dr. Mike truly wants every Chiropractor to succeed for their own benefit and for the benefit of those whom we serve. His methods are tried and true and reproducable by anyone..."
Day 1 and Day 2 scripted procedures to move a new patient predictably to "YES" for care. A proven system to bring a new C.A. 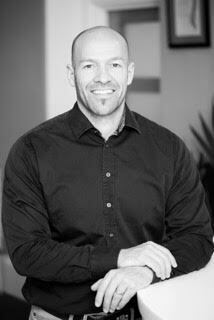 up to speed on anatomy, philosophy and our chiropractic language. 6 key elements every C.A. needs to perform to get every family member on care. The secrets to morning huddles, goal setting and managing your patients. How to ask for and get tons of referrals...right from the front desk. The travel card short codes, clinical codes and how to block and cluster book. Understanding rescheduled/missed appointments and handling the chronic problem patient. The art of the confirmation call, flex schedules, vacations and discontinuing care...that even doctors don't know about. How your C.A. will turn every guest at your "Doctor's Report" into a new patient. 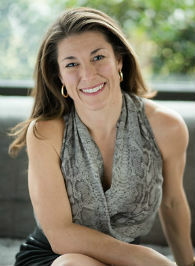 How to master the art of getting your patients onto lifetime wellness care! Scripts when your C.A. has to double as a tech or exam C.A. We call this cross-training. Secrets to collecting every dollar whether it's pay per visit, insurance or a care plans. Distinctions between a good C.A...and a great one! And why you need to set the ground rules first! Master checklists, End of Day sheets, communication sheets... and much, much more! And all that extra stuff you've never heard of doc, but that's absolutely critical in a million-dollar (or more) practice!!! 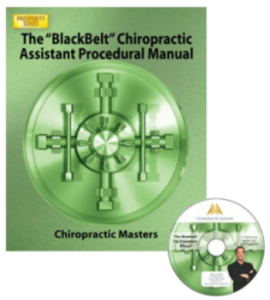 Your Black-Belt Chiropractic Assistant Procedural Manual has over 10 modules that are the backbone of some of the most successful practices in the world today! FINALLY! A Clear And Concise System That Details Everything You Need To Know About Hiring, Training, Keeping A Chiropractic Assistant And Boosting Your Income! When You Purchase “The Black Belt Chiropractic Assistant Procedural Manual” TODAY, You’ll Get The Following BONUSES 100% FREE! The true value of the complete package that you are getting today (Black Belt C.A. Procedural Manual & Bonuses) is worth over $10,000. Why? Because you really can’t put a price on replacing a C.A. I can boldly make that statement because of the hundreds of thousands of dollars that I have invested over the last 25 years, into my training and business education. Furthermore, the training found in this manual is the same training I use for my C.A.s today in my million-dollar practice and hundreds of others worldwide: as well as in our current seminar training. However, you won’t have to pay that amount of money to enjoy the endless benefits of owning your own “Black Belt C.A. Procedural Manual”. Why You Risk Absolutely Nothing With My “Make You Happy C.A.” Guarantee! I’m so positive that this will work for you that I’m willing to offer you a 100% “Make You Happy C.A.” Guarantee. If you can prove that my marketing toolkit did not help you with quickly training and improving your front desk dynamics, then I’ll refund your money invested. HINT: Use my “Bring A Friend or Family Member” flyer and “Family Gift Certificate” to quickly pay for this product. You don't have to wait to create a safety net of your own. You can order your very own “Black Belt C.A. Procedural Manual”. Order today and let's start getting your C.A.’s up to speed, add more new patients, enhance your procedures and create a much better monthly income. 2. Have your C.A.’s study from your new manual with only 15 minutes per day. 3. Role play at your weekly team meetings. 4. Slip and check with the procedures and scripts. 5. Watch your practice and income grow! I get accolades every month from doctors who are grateful to have a manual that has basically SAVED their practice. This is our newest version 3.0. We gave it an overhaul with fresh procedural techniques and current products that work in today’s competitive Chiropractic market. I'm really proud of this product that we have put together for YOU. Not only will you see your practice and income grow, but think of the lives you’ll save because you have Black Belt C.A.’s in your practice. The RESULTS...an increase in new patients, improved procedures, superior quality of service and care, and a dramatic increase in their monthly income…in as little as 30 days. Your investment cost as little as 7 adjustments. Compare that to the price of replacing and training a new C.A... PRICELESS!